Long ago, Jimmie Rogers asked "does that piano travel?" The rest is musical history! David was born in St. Louis and later relocated to Kansas City. Krull grew up in two of the most musical cities in America and began playing piano at the age of seven. He became interested in Blues, Boogie, Jazz and Rock & Roll at thirteen. At sixteen, he was sneaking into the historic jazz and blues clubs of Kansas City to listen and learn from the many musical legends he encountered. Krull returned to St. Louis where he joined the thriving music scene. He often performed solo as well as appearing in concert with St. Louis piano legend Johnnie Johnson. Prior to his passing, Johnson rated Krull as one of his favorite piano players. David met Chicago blues legend Jimmy Rogers of the original Muddy Waters Band. Rogers asked him to join the band and Krull performed and recorded with him until his death in 1997. During that time, he appeared on bills with artists including Bonnie Raitt, Dr. John, Charlie Musselwhite, Buddy Guy, Solomon Burke, Etta James, Robert Lockwood Jr., Koko Taylor, James Cotton, Luther Allison, Homesick James, R.L. Burnside, Charles Brown and many more. Krull has also performed and recorded with Hubert Sumlin, Carey Bell, Rogers’ son Jimmy D. Lane, Jeff Healey, Kim Wilson, Elvin Bishop, Maria Muldaur, Joe Louis Walker. The list goes on and on. 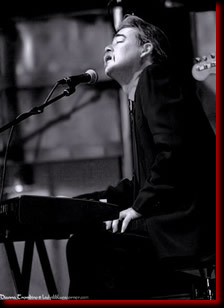 David Krull celebrated the release of his first solo recording 'Can’t Let Go' in October of 2005. The thirteen songs showcase David’s versatility. While emphasizing boogie and blues, he adds touches of ragtime, jazz and pop. A DVD, the David Krull Story is also available. David’s music was featured in the documentary Can Mr. Smith Get To Washington Anymore?